When to plant -- Your bulbs will sprout in autumn, usually around mid- to late-October (April in the Southern Hemisphere). Until then, store them in a paper bag in a cool spot. Or you may plant them in soil before autumn, if the soil can be kept almost completely dry until autumn. Either way, store them out of direct sunlight. Note that they may sprout in autumn even if not in soil, so don't wait too long to plant them. Pot size -- Use a pot about 6 inches tall (15 cm), and wide enough so each bulb is at least 1 inch (3 cm) from the next one, and from the edge of the pot. Use a pot with drainage holes. If you live in a warmer climate, use a larger, clay pot, to keep the roots cooler. Soil -- Use a fast draining soil mix. A typical mix is 1 part quality potting soil to 2 parts coarse horticultural sand or perlite . An alternate mix 1 part coir fiber to 2 parts perlite or coarse sand, with some granular fertilizer mixed in. Planting the bulb -- The top of the bulb usually is pointier than the bottom, which is flatter. If you can't tell which end is the top, just plant them sideways and they will straighten themselves out as they grow. Bury them so the top of the bulb is 1 inch (2.5 cm) deep. In mid-October, water the soil lightly until it is slightly moist (not saturated), and keep it this moist until they sprout. They should begin sprouting within a few weeks of watering them. Once they sprout, move them to a sunny spot. Full sun is best throughout winter in most locations, but if you are in the tropics, or if temperatures get above the low 70s (23°C) in winter, they might need some afternoon shade to keep cool. Watering -- Keep the soil evenly moist throughout the growing season. Avoid letting it dry out completely, but also don't keep it constantly saturated or the bulbs might rot. If you're unsure if the soil has the proper moisture in the root zone, use a moisture meter . Climate -- Throughout winter, it prefers temperatures between about 50 and 70 degrees F (10-22 degrees C). Warmer temperatures in winter may make the plants lanky, and hot temperatures or warm nights might stress them. If you're in such a climate, you can keep the bulbs cooler by placing the pot inside a larger pot, which is then filled with soil. Keep them from freezing. Lighting -- They prefer mostly sunny conditions throughout winter & spring. Some afternoon shade may be needed in warmer, lower latitudes such as Florida, while full sun is best in the higher latitudes. If you can't give them sun during winter, keep them 2 inches (5 cm) away from a bright LED light (See: "Growing indoors with LED lights"). Feeding -- This bulb has relatively low fertilizer requirements. Feed about a week after they sprout, and again 2-3 months later. Use an all-purpose fertilizer that contains micronutrients. Avoid feeding after March. Dormancy care -- In spring, the bulbs will begin to die back to prepare for their summer dormancy. Reduce watering during this time, giving just enough water to keep the soil from drying out completely. Once the leaves have died back, you may remove the bulbs and store them in a paper bag in a cool spot until autumn.. or just leave them in their pot. Every 2-3 years, they should be separated and planted into new soil. Pests to watch for -- Mealy bugs might grow on the bulbs indoors. 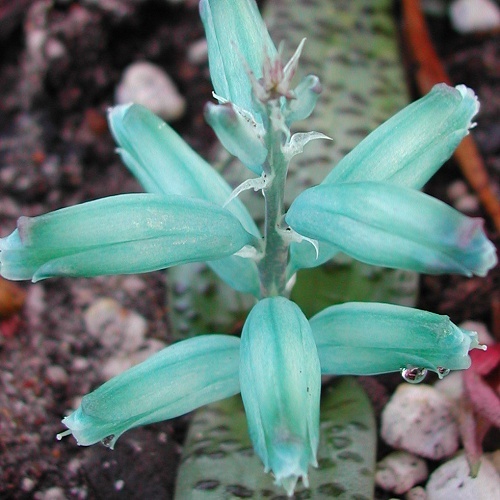 Look for cottony growth on the leaves near the soil, which means the bugs are on the bulb. Try using an insecticidal soap soil drench to kill mealy bugs.